Mylar Heat Shrink Tubing is a superior, high dielectric insulation material that provides a tight, smooth protective covering. It is extremely easy to use and is suitable for hand or machine application, with no special or costly shrinking equipment necessary. 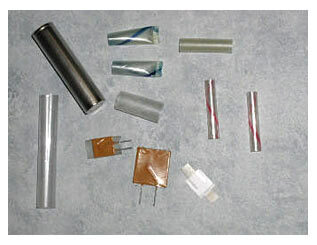 Mylar tubing may be shrunk by heat guns, electrical coil heaters or ovens. It is shrinkable by as much as 50% of its diameter in order to provide an immovable, tight fit. Temperature requirements are as low as 90°C for shrinking purposes with a heat cycle as short as one second. Mylar Heat Shrink is spiral wound to practically any diameter and length. It is an excellent choice for both high temperature and electrical insulation; for protection of coils and components; or as a replacement for tape. Physical property values are published by DuPont and are typical for 65 gauge Mylar polyester film. Further information on Mylar film is available from the DuPont Co. Our Engineering Dept. will be glad to work with you on individual requests.